Golly Bob Howdy! 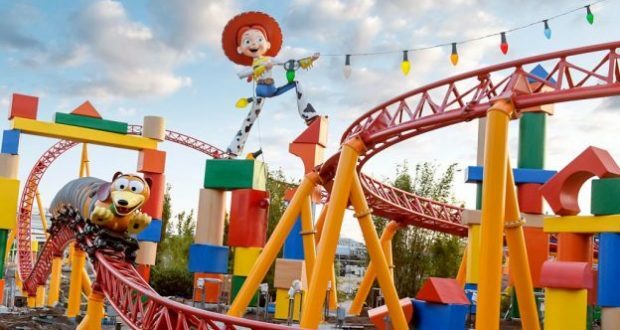 After visiting Walt Disney World last week and going to Toy Story Land 4 times on different days I think it is safe to stay we were impressed. We loved everything about the land, but it was Slinky Dog Dash that brought us back 2 nights that we had not planned in advance. My 6 year old is obsessed with that attraction and I think you will be impressed too. I wish Slinky Dog Dash had the ride video we’ve come to love on Tower of Terror and Seven Dwarfs Mine Train, I think there are a couple of spots that would be perfect. Without the structure around the coaster I guess it is harder to set up. 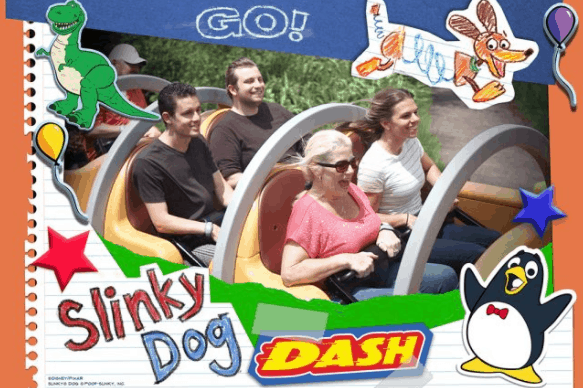 But, there is a great on ride photo that attaches automatically to your account with a really cute border. And I love any ride that has that little bonus touch to capture everyone enjoying the moment. This may sound like a cop out for a list of most impressive things, but we were all very impressed with the ride. It is smooth so no throwing guests around in the cars causing discomfort. And it is thrilling. I think part of the thrill is that you are just up in the air on the track itself. Unlike Seven Dwarfs Mine Train or Big Thunder Mountain Railroad where you have structure under you and around you—you really feel the height and angles on Slinky Dog. I loved it, but I am a ride weenie and I will say it is probably at the ceiling of what I would be able to tolerate. From tall dips, to fast turns, and even an up & down hump section, Slinky Dog Dash is one impressive yet family-friendly coaster. I love a good queue, especially when wait times can be long with a brand new attraction. Slinky Dog Dash’s queue is fun and impressive with the amount of details the Imagineers included. Like the rest of Toy Story Land, the landscaping with tall grasses continues that feeling of being the size of a Toy. And you are surrounded by other toys that have been left in the yard, or that Andy is using to create this imaginative structure around the Slinky Dog Dash Coaster. And to add to the fun of waiting in line and make it go quickly, check out the Play Disney Parks app—there is a great game you can unlike while in the Slinky Dog Dash queue. Just don’t forget to look up often so you don’t miss those fun details. Slinky is adorable in the day time, but at night he takes on a whole new character. The area lighting is fantastic, but running lights along the coaster track that change color add to the kinetic energy of that part of Toy Story Land. I noticed them more while watching the ride from the walkways than while I was actually on it, but you do see them up ahead of you and it adds to the thrill of the ride. I love Slinky Dog in the Toy Story films. His voice casting in perfect and he has some great lines. “”Buzz! Buzz, my back is goin’ to Baton Rouge! Aah!” and “I may not be a smart dog, but I know what road kill is.” On Slinky Dog Dash Slinky talks to you! And he enjoys the ride with you. I love this small addition that makes a big difference. In the attraction I absolutely love it & it makes me laugh when he says “hang on!” in the launch section. Much like the ending of Seven Dwarfs where only people who have been on the ride can see Snow White dancing with the dwarfs, Slinky Dog Dash has a similar “surprise” ending. 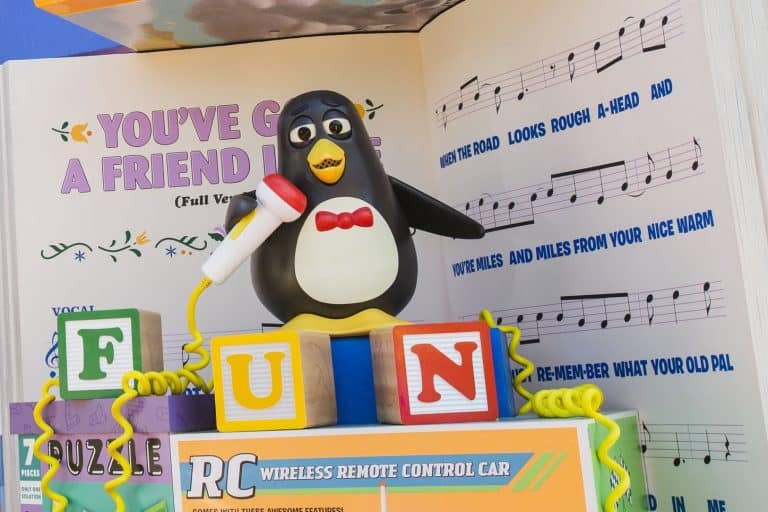 Once you pull back into the station you are serenaded by Wheezy singing You’ve Got A Friend in Me. This giant audio animatronic is absolutely adorable! That Andy has quite an imagination setting up this coaster. And speaking of Andy’s imagination, the queue is filled with nods to his plans to covert an off the shelf roller coaster set into the amazing Slinky Dog Dash. Be sure to pay attention to these areas of the queue (they make great photo ops as well). With 3 little boys it totally reminds me of things they would come up with, altering the track and creating a way to tie Slinky Dog into the ride vehicle. And I’m only slightly concerned by the spare parts I see lying around the queue unused LOL. Spoiler Alert! If you haven’t ridden or have somehow missed all of the videos online and on TV of Slinky Dog Dash you may want to skip this one and leave it to surprise you on the ride. But, my favorite part of the ride, which I think is genius on Andy’s part, is when you come to a stop in the middle of the ride. 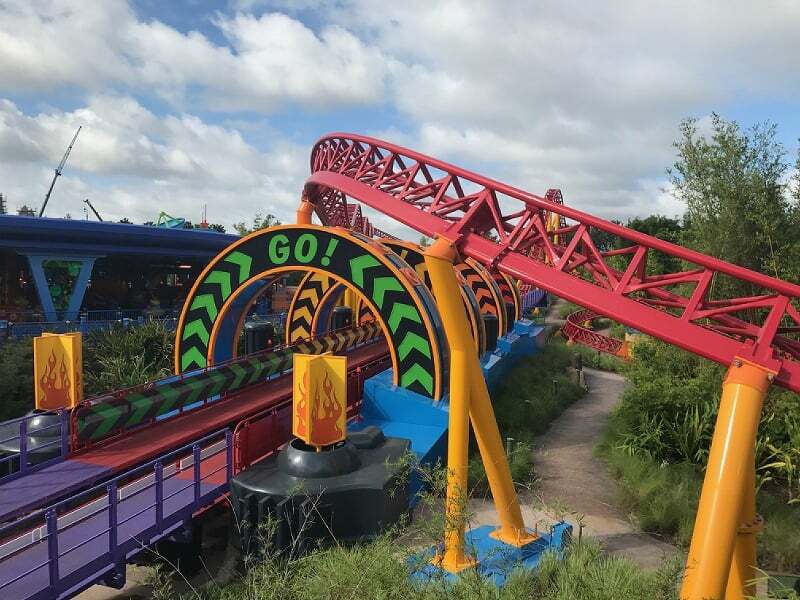 Slinky rolls back (when he says “hang on!” and after the countdown you are launched forward and immediately up a hill and back down in one of the most thrilling sequences on the coaster. It is fun, well themed and a big thrill! 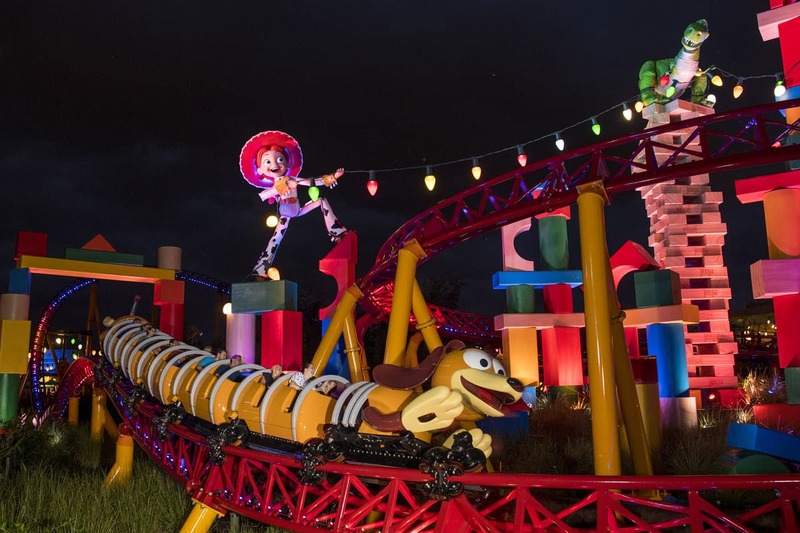 What do you find most impressive about Slinky Dog Dash?